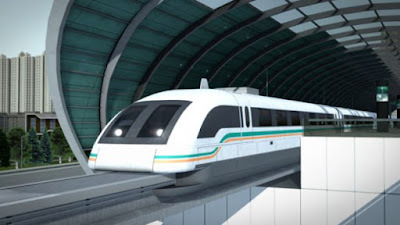 FOCUS TRANSPORT: Liverpool to Manchester Maglev? A “hover train” line that could get passengers from Liverpool to Manchester in just SEVEN minutes is being considered by transport bosses. Direct City Networks (DCN) is developing a plan for “the world’s fastest underground system” that could run from Liverpool to Manchester and eventually to Hull. DCN300+ would be a Maglev – magnetic levitation – system where vehicles hover above tracks and are propelled by electrically charged magnets. That reduces friction to a minimum and means vehicles can go at up to 350mph, faster than any conventional train in Europe. A proposal has been submitted to Transport for the North, the Government body looking at improving the region’s transport links. And the ECHO understands Labour’s candidates for the Liverpool and Manchester metro mayor roles, Steve Rotheram and Andy Burnham, are looking carefully at the scheme. It is set to be launched publicly in the near future but the ECHO has seen a brochure with more details of the proposal. At the heart of the DCN scheme is a line between Manchester and Leeds, with a journey time of nine minutes. That line could then be extended to Liverpool and Hull – meaning it could also be used by freight traffic between the two ports. Rather than using long “trains”, the system would instead use passenger pods, or capsules. DCN believes a tunnel would be the best option for its line as it would allow for a straight line and would avoid the costs and disruption associated with building a new intercity line at ground level through cities and the Pennines. DCN has worked with Hyperloop, the company created by US billionaire Elon Musk that wants to run magnetic pods at more than 600mph. But while Hyperloop would pump the air out of its tubes so the carriages could run even faster, the DCN plan would see the pods run through tunnels at normal air pressure. There are now several Maglev lines in Asia. The best-known is the Transrapid system in Shanghai, the world’s fastest commercially operating train, which can reach speeds of 267mph. In Japan, the Chuo Shinkansen line currently under construction would allow trains to travel at more than 300 miles per hour between Tokyo and Nagoya. Most of that journey will be underground. In 2015, a Maglev train in Japan set a world speed record of 373mph on a test track. The cost of that initial Manchester to Leeds line could be between £2.2bn and £3.7bn. But DCN estimates that the line could grow GDP across those two cities by £1.3bn a year and create 48,000 additional jobs. On that initial Leeds-Manchester line, pods could leave as often as every 60 to 90 seconds. DCN will soon reveal its early proposals and will then move forward to a detailed feasibility study to attract the billions of pounds of investment that would be needed. DCN’s advisers on the project include international accountancy firm KPMG, global engineers Arup and consultants from Imperial College London. A spokesperson for Transport for the North said: “TfN has been provided with information by Direct City Networks (DCN) PLC regarding a proposal to initially link Manchester and Leeds with a high speed ‘MagLev’ connection, with the possibility of this being extended to Liverpool and Hull. “We have responded to DCN, highlighting several areas where we think substantive additional development work would be needed before any proposal could be given more detailed consideration.